Florence, SC Exit 160: No, you’re not seeing things, those randomly placed pianos throughout Florence are part of Play Me, I’m Yours, an initiative of a worldwide street piano project, geared to interconnect people in the community by “expressing themselves” by bringing pianos to the people and music to the streets. 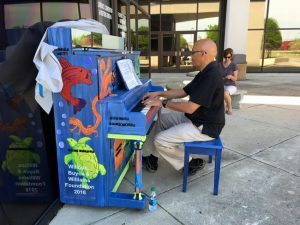 Dozens of Pianos will be located all over Florence and Lake City, and will remain available until May 7, positioned for everyone to play and enjoy on streets, in parks, squares, markets and other public places. Play Me, I’m Yours invites the public to engage with, participate and take ownership of their urban environment. Decorated and personalized by local artists and community groups, the street pianos create a place of exchange and an opportunity for people to connect. Touring internationally since 2008, Play Me, I’m Yours was created by British artist Luke Jerram. More than 1500 pianos have now been installed in over 50 cities across the globe, from London to Lima, bearing the simple invitation Play Me, I’m Yours. The project has already reached more than ten million people worldwide. An opening-night festival will be held April 21 in the Willcox Plaza on West Evans Street. 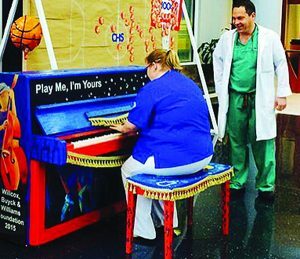 The event will include a dueling pianist team and a “Paint a Piano” tent for young artists. Don’t miss the featured noon concerts on various instruments by local pianists. Bring Your Own Improv’s Family Friendly Comedy Show is a rarity – a comedy club that you can bring your kids to. 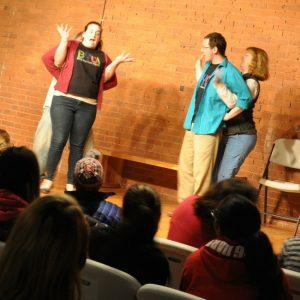 Bring Your Own Improv (BYOI) is now in its 10th season and family-friendly comedy shows are Fridays at 7pm. This interactive improv show welcomes voluntary audience participation, of all ages. The format is similar to “Who’s Line is it Anyways” where different games and scenes are set up. The troupe asks for audience input, the actors put their own spin on scenes, and the action changes constantly, so no two performances are ever the same. 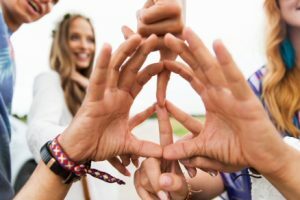 They encourage you to participate in one of three ways: Applaud at a scene you like, yell out fantastic suggestions, or if you feel you’re ready, jump up and get involved with the performers on stage. So if anyone in your family wants to flex their comic muscles or would just like partake and play along, the clever and creative cast will support you. No worries, they only choose volunteers with hands up . Why not start your weekend off with some laughs, the players are pros and know how to keep the audience entertained. Sit back and chuckle your cares away with this fun, inexpensive night out with the family. 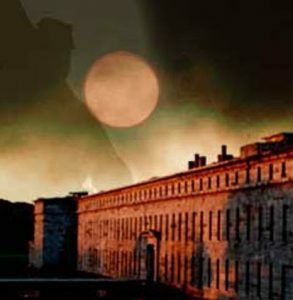 This is a hidden gem if you’re looking for something to do while on a family vacation in the Providence or Newport area. There’s also a Late Night Comedy Show (PG-13) Fridays at 9pm. Travel around the world in just one day at the Bowie International Festival and learn about traditions and customs that span the globe at this multicultural, FREE fete. The International Festival will showcase performing arts, visual arts, and cuisine from various regions and cultures throughout the world. Listen to bagpipes and violins, watch Moroccan belly dancing or Irish step dance, and enjoy lots of tasty international food. 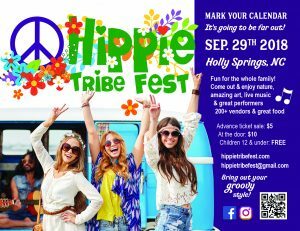 The event will also feature a wide variety of artists and crafters selling clothing, jewelry, crafts and other items from around the world. The most fun might be for the children, where they are able to pick up a passport at any children’s activity booth and participate in various activities from different cultures, accumulating stamps at each booth. Activities include dance, music, story time and arts and crafts from around the world. At the end of the “trip” children receive an international prize. Delaware’s 30th Annual Amish Country Bike Tour is held in the state’s capital, Dover. It is the largest cycling event and one of the East Coast’s favorite bike tours. Last year, 2,200+ cyclists from 25 states and England participated in the event. The Bike Tour starts and stops at Dover’s historic open air park, Legislative Mall. The tour has five loops: 15, 25, 50, 62 and 100-mile loops through FLAT back roads, farmlands and Delaware’s Amish community. 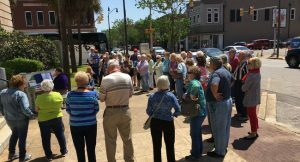 Along the route, there are four food-rest stops with food and beverages, slices of locally baked pie and a fully-catered BBQ meal at the end of the tour. 24 mySQL queries executed in 0.286 seconds.